The most northerly street and the last in our series of Three Ms is Morehead Avenue, and like the others it is named after an early politician. 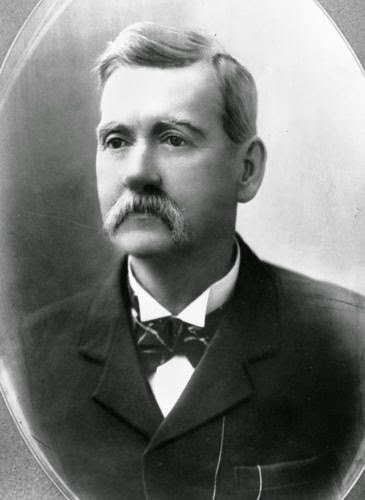 Boyd Dunlop Morehead, born in Sydney in 1843, was a conservative Queensland politician aligned with Sir Thomas McIlwraith, and in 1888 he succeeded McIlwraith as premier of the state. Here is a photograph of him that was taken in 1888. Morehead was an astute businessman and a canny investor. In 1873 he established BD Morehead & Co, a stock and station agency as well as a mercantile trading business. He first entered parliament in 1871 as the member for Mitchell and later became the member for Balonne. By 1877 his business interests were substantial - he had thirteen stations in the Mitchell area. 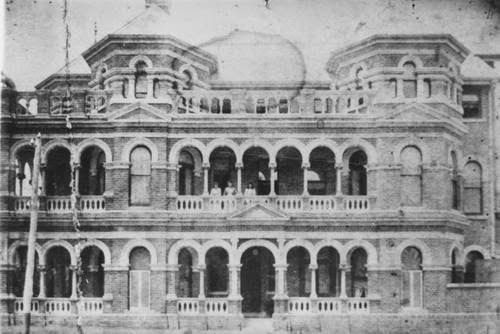 Next he embarked on real estate acquisitions in Brisbane, purchasing a share of Harris Terrace in George St in 1887 and then in 1888 in partnership with others he commissioned the construction of The Mansions, also in George St. Both of these buildings are still standing and are listed in the Queensland heritage pages. Here is a photo of The Mansions circa 1892. In 1886 Morehead and his family made a trip to England. Here is a link to a newspaper report of a banquet given in his honour prior to his departure. It is a rather long article but well worth reading by those with an interest in the social mores of the time. The attendees were political colleagues and foes alike, and all seemed to have a complimentary word for Morehead, who was a popular member with a witty persona. For example: the Queensland government appointed Mr Clement Wragge as government meteorologist in January 1887 to study the effects of cyclones on shipping. 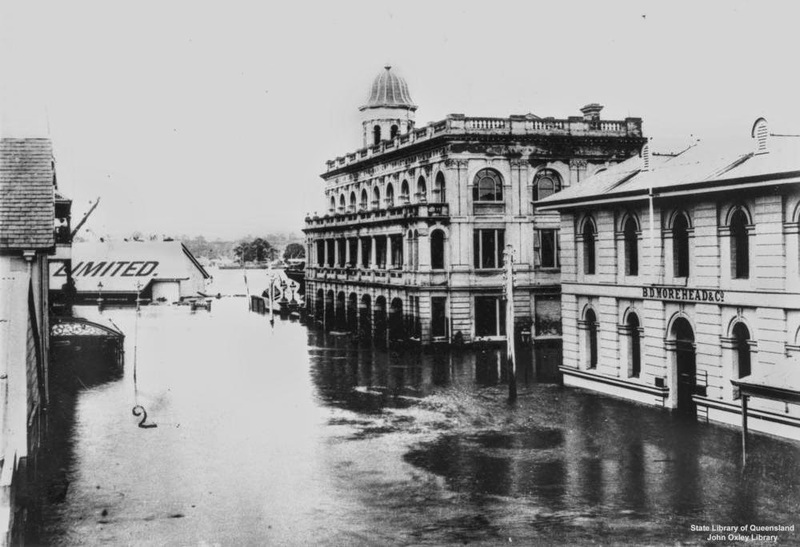 He arrived in Brisbane as 18 inches (450 ml) of rain was falling - this prompted Morehead to dub him Inclement Wragge. Morehead's sister Margaret was the mother of Helen Lyndon Goff, who as PL Travers was the author of Mary Poppins. The 1893 Brisbane flood and subsequent depression became an issue for Morehead's businesses. Like his political colleague McIlwraith, Morehead was caught up in the collapse of the Queensland National Bank where he was a director and substantial shareholder. Here is a photograph of the BD Morehead & Co business premises in Mary St under threat from the floodwaters (on the RHS of the image; the building behind it is Naldham House). Boyd Dunlop Morehead died in Brisbane on 30 October 1905. PS - As a point of interest the next street north is Thynne Avenue, named after Andrew Thynne - he was another politician of the same era. I don't know anything about his political or business successes, but his taste in architecture was very impressive. The 1887-8 real estate acquisitions in Brisbane that you refer to, including Harris Terrace in George St, The Mansions in George St and BD Morehead & Co business premises in Mary St, all show good taste. Sensible. Reliable. Trustworthy (despite the 1893 depression). Yes, Hels. We are lucky to still have Harris Terrace and The Mansions with us. Regrettably the Morehead warehouse has been demolished, replaced by a glass and steel tower.